This is the BEST cinnamon roll icing, made with only five ingredients including vanilla and cream cheese. 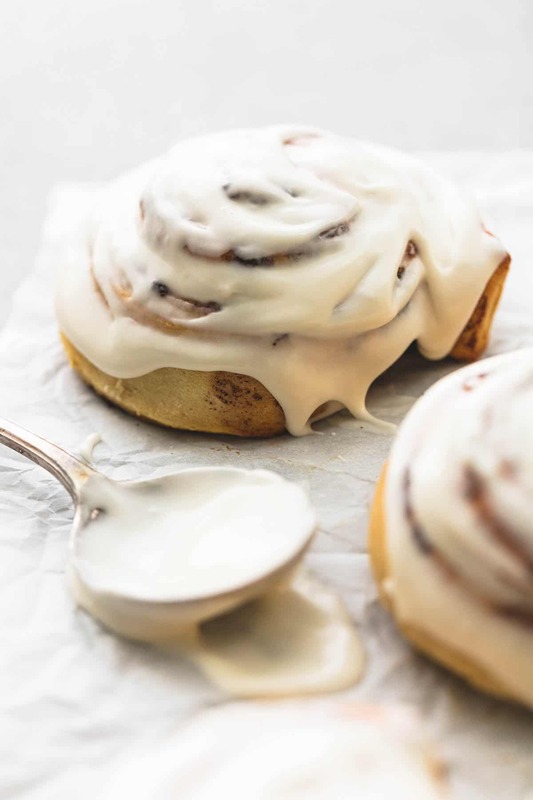 This perfectly creamy and rich frosting is easy, ready in 10 minutes, and will turn ordinary cinnamon rolls into the ULTIMATE breakfast. Looking for another dessert to wow the family? Try Red Velvet Cheesecake Bites, Cream Cheese Lemon Crumb Cake, and Salted Caramel Stuffed Double Chocolate Cookies. This is it. The ultimate, best ever, perfect in every way, cinnamon roll icing to end all cinnamon roll icings. Step aside Cinnabon. I’ve been making this scrumptious icing for a few years now. It’s rich, creamy, silky smooth, and just the right texture and spreadable thickness. It’s so amazing I’ve even used it for cakes, cookies, brownies and bars, and for dipping everything you can imagine. Even though I am this icing’s number one fan, I’m not the only one who feels this way. I’ve had people make cinnamon rolls and phone in a special order of this icing because they love it so much. So I’ve whipped up a batch, or even a double or triple batch, to bring with me to brunches, ready to spread on someone else’s fresh-from-the-oven cinnamon rolls. 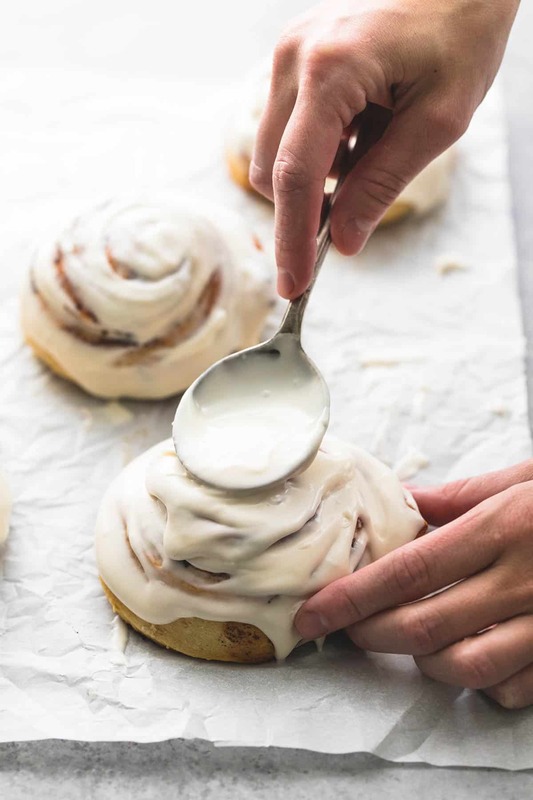 So maybe half of the reason I’m sharing this cream cheese cinnamon roll icing recipe with you is to put myself out of a job and be able to bring nothing but my hungry belly to the next brunch. Pretty sure all of those people who asked me to make this frosting for them never would have guessed it only requires 5 ingredients and about 10 minutes. That’s it. So what makes it so much better than other icing recipes? One very important step sets it apart. Browning the butter. All you have to do is melt the butter on the stove (a lot of recipes will call for softened butter, but melting the butter is key here) and after it’s melted, stir it a few extra minutes over medium heat until the color darkens from light yellow to a golden yellow. That browned butter combined with the cream cheese and vanilla is what makes this icing so utterly perfect. This is the BEST cinnamon roll icing, made with only five ingredients including vanilla and cream cheese. 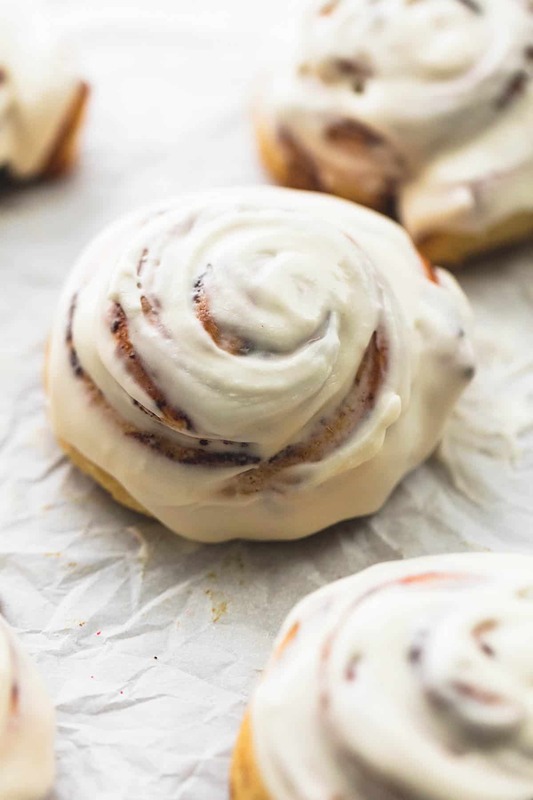 This perfectly creamy and rich frosting is ready in 10 minutes and will turn ordinary cinnamon rolls into the ULTIMATE breakfast. Melt butter in a medium sauce pan over medium heat. Once butter is melted, continue to whisk over medium heat until butter turns from yellow to a golden color. Remove from heat. In a medium bowl cream together butter, cream cheese for 2-3 minutes until very fluffy and creamy. Mix in powdered sugar, one cup at a time, adding 1-2 tablespoons of milk after each addition of powdered sugar. Once all of the powdered sugar is incorporated, mix in vanilla and more milk (1 tablespoon at a time) until icing is a smooth spreadable consistency. Spread immediately on cinnamon rolls, or store chilled in airtight container up to five days. Makes enough icing to generously top about 12-16 cinnamon rolls. Try this Frosting over these cinnamon rolls! This icing looks delicious! I have been craving cinnamon rolls lately – I’ll have to make some and use this icing! Mmm! You are right….this is the best! Thank you for sharing! Have you ever frozen the icing? I’m making a ton of cinnamon rolls for a fundraiser, and they will need to go in the freezer. Way too much powdered sugar in my opinion. Would be a perfect recipe with only 1 – 1 1/2 cups. Other than that great recipe! Your recips look great but there are way too many adds to sift through to get to them. Sweet rolls and frosting are wonderful. I cannot print recipe from my ipad. HEy, i have a question. Does this icing tastes like cheese? Sorry if I’m being dumb. I does not! It is definitely not intended to, that’s for sure! Usually I’m not a fan of icing but this one was delicious! The only issue with this recipe is it doesn’t say what to to with the melted butter. Does it go into the frosting at some point? This is one of the best recipes for icing! it has a great flavorfor pastries, especially cinnamon rolls! I do agree with george, it dosen’t need that much powdered sugar. I feel you want to taste the BUTTERY PLUS sugar taste. Cant wait to try it! My daughters are making peach cinnamon rolls for the fair, im wondering if they could mix some pureed peaches or Small diced or maybe even peaCh juice in the glaze? What do you think? Hi Teresa- I think that should work! I haven’t done it myself, so I’d love to hear how it turns out!! Could tHis be used on monkey bread? Absolutely! Sounds DELICIOUS to me! My Frosting is always gritty. Whats wrong? 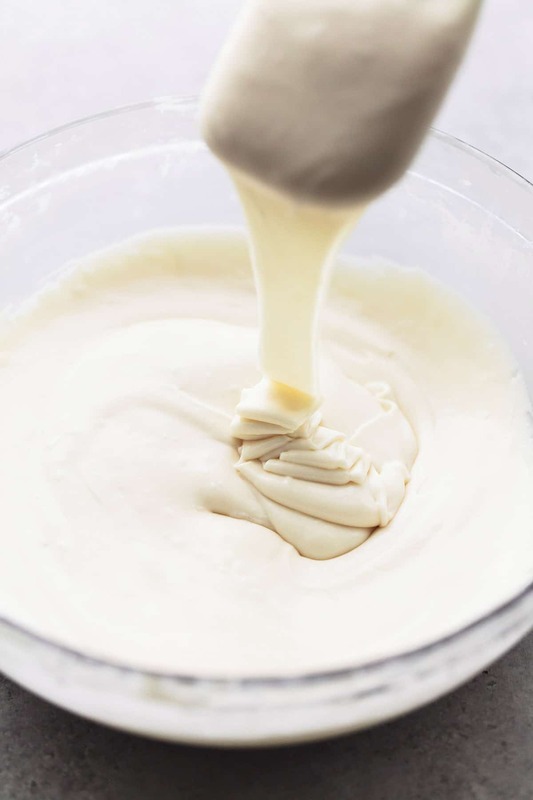 Your frosting shouldn’t be gritty if you are using powdered sugar… make sure that you mix it on high for a few minutes to ensure that it’s not gritty and becomes fluffy and smooth! I’ve made this numerous times and never had it end up gritty! Hi Anna- I am not completely sure I understand what you mean…. a mixer is definitely recommended for this recipe! The directions were perfect, everything turned out well, the icing itself is simply to sugary for my personal taste. I was looking for a butter cream recIpe that is more rich than sweet (like cinnabon) but this is not it. I will be on the lookout for aomwthing different next Christmas. Rebekah- thanks for your feedback! The absolute best icing ever! Im never make any other recipe! Super excited to hear that you love this icing recipe, Meg! Thanks for your feedback!! Hi Joyce- it doesn’t harden completely! However, I wouldn’t describe it as gooey either! this icing is fantastic!! I love the brown butter flavor in this!! I thought it was weird pOuring melted butter in the cream cheese but it didNt curdle and Came out great! Totally making this again! Thank you for sharing! Way to stick to the recipe even with your doubts, haha! 😉 I am super excited to hear that you enjoyed this icing so much! Thanks for your feedback, Flori!